Issue 2: We Rock the Bot! 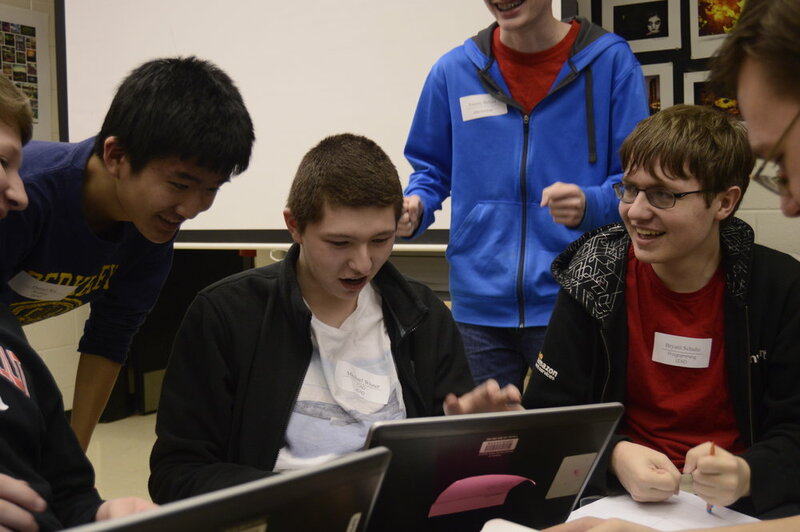 TALON 540 hosted our very own FIRST Lego Leagues at Godwin High School. Read more…. Issue 4: 540 Blasts Off! Issue 5: 540 Takes Their Maiden Flight! A lot of progress was made in this first week of Build Season! Our team is ready to blast off into the busy weeks of build season and beyond. Read more…. Issue 6: Orbiting Around the Clock! We have made huge progress by working hard to finish prototyping mechanisms. Read more…..
Issue 7: Blasting Towards the Finish Line! We've been on a roll this week and working hard to finish up and stay on schedule! Read more…..
Issue 8: And We Have Lift Off! We're already at week 4! We have been working extraordinary hard this week to stay on top of our schedule! Read more…. Issue 9: T-Minus 1 Week! Issue 1: Ready, Set, TRAIN! Here we are again! Robotics season began once again with more energy and passion as ever. We encouraged many freshman and others to join our team and follow the STEM career. Read more…. Issue 2: Making it LOUD! Last Saturday the 7th, our team attended Makerfest to encourage young children to follow the STEM pathway. Read more…. Issue 3: Ready to Rumble! Rumble in the Roads is a pre-season FIRST robotics competition, a modified version of last year's game, STEAMWORKS. Read more…. Issue 4: FIRST Lego League! On November 18th, TALON 540 hosted a FIRST Lego League event at Godwin High School. Many of our members volunteered their time to organize this event for the kids. Read more…. For the two weeks of the month that we were able to meet, our entire team continued to train and prepare for the new season. Read more…. Issue 7: The Beginning of Our Journey! Succeeding Kickoff, we immediately began the new season with prototyping. Read more…. Although Week 1 ran smoothly, Week 2 and Week 3 of Build Season were cut short due to an unexpected winter storm. Read more…. We began Week 4 with a great start! Though we encountered scheduling issues in Weeks 2 and 3, the entire team worked diligently and we were able to get back on our feet. Read more…. The deadline is approaching soon! In comparison to previous years, our team accomplished so much in this short period. Read more…. This build season started with a blast and and ended victoriously! Though there have been some obstacles in our way, we successfully overcame them with our new skills we gained this season. Read more…. After weeks of preparing our robot and prepping the drive team, we finally demonstrated our skills at the Central Virginia Districts competition this past Saturday and Sunday at Deep Run High School. Read more…..
Issue 1: Old Tricks, New Team! We're back! We've stayed busy since winning the entrepreneurship award at the worlds level. Read more…. Issue 2: Our FIRST Competition! From preparing for Robot Rumble to training the rookies the team has had an eventful month. Read more…. Issue 3: Rumble? FLL? Oh my! Issue 4: The Finalized Roster! 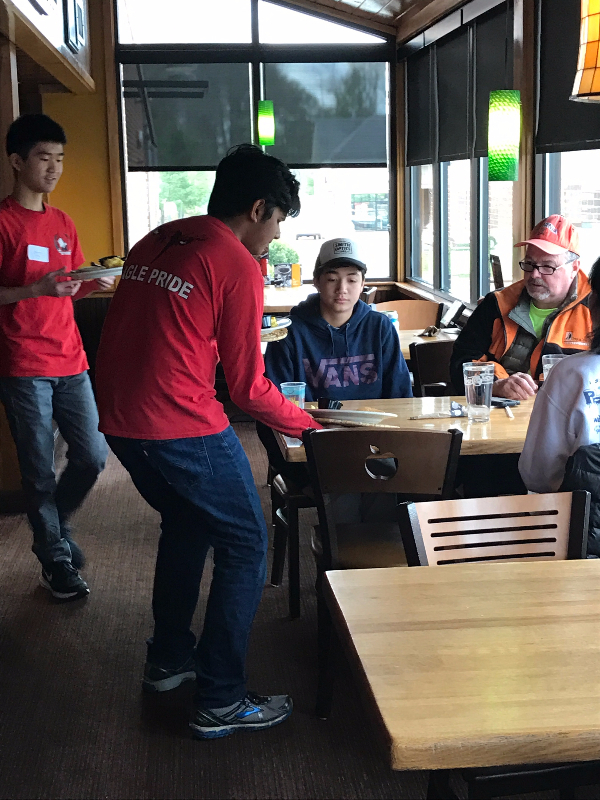 TALON 540 conducted their first successful fundraiser at Applebee's. Each member was responsible for selling two tickets each valuing $12. Read more…. Issue 5: A Snowy Kickoff! The Bombini Bot, a TALON 540 creation, is a simple robot utilized for exposing young children to the vast world of technology. Issue 7: A Teaching Curriculum? During the second week of build season, the strategy we created was finalized. Read more…..
Issue 8: A New Trailer! Our second successful fundraiser occurred on Saturday, January 28th at Applebee’s. Read more…. Issue 9: A Final Proto? Every year, our team selects two members who best represent FIRST traits to be in Dean’s list. Read more…. Issue 10: Week 5, a Success! Recently the Programming subgroup has been quite busy. Read more…..
Issue 11: Build Season is Over! Now that Strategy has access to the robot, they can complete the selection process of the drive team. Read more…. Issue 12: Victory at Southwest VA Districts! After much hardship and dedication, our team demonstrated our talent at Blacksburg, Virginia. Read more…. Issue 13: Success at Central VA Districts! Issue 1: School's Out, Scream and Shout! 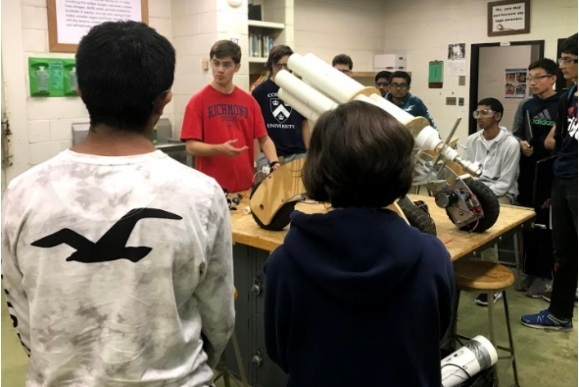 Just because school is out and summer is here doesn't mean robotics has to end. In fact, TALON 540 is a year round deal. Read more…. Issue 3: The FINAL Team Roster is in Place! We are really fortunate to have so many people interested in our team this year. You can feel the excitement in room 31 whenever we start a meeting. Read more…. Issue 4: Time to Rumble! Rumble in the Roads is a pre-season FRC competition. This year, the competition was a modified version of last year's FRC game, Recycle Rush. Read more…..
Issue 5: 3... 2... 1... LEGO! Once again a huge amount of people and teams turned out for our annual FLL tournament hosted at our highschool. Issue 6: Kickoff? Stronghold? What the FIRST happened early January? Every year, the game animation is livestreamed to FRC teams throughout the world. Kickoff, the day the game animation is show, is when TALON 540 figures out how we should design our robots. Read more…. Issue 7: Oh My FIRST! We Have a Final Design! At this week’s TALON 540 meeting, the programming subgroup plans to perfect existing codes, start drafting ideas for autonomous modes, and start creating this year’s sensor book. Read more…..
Issue 9: Shooting is Improved! The improvement on our shooter can be attributed to the joint effort of Danny and Tommy, along with our beloved adult mentors. Read more…. Issue 10: BombiniBots? A Children's Book? This week we visited the Peter Paul Development Center and taught students how to build and program their own robots using “BombiniBot” curriculum. Read more….. This weekend, TALON 540 will be heading southwest to attend our first of two district competitions! Read more…..
Now, TALON 540 will be heading due north to attend our second and final district competition! Our trip to the state championships was filled with hard-work and dedication; every dilemma was approached with a positive attitude and ingenuity. Read more…. Issue 14: We did it! World Championships! After a fourteen hour bus ride from our nest in Virginia to the World's city at St. Louis, Missouri, a small task-force set up pit at the stadium. Read more….